Essential PHP Security Is Finished! 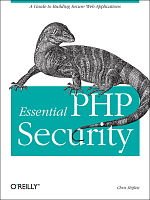 A little over a month ago, I finally finished writing Essential PHP Security, a guide to secure PHP programming that I've been working on in my spare time for quite a while. I'm really happy with the results. The people at O'Reilly have been great to work with, and I was lucky enough to have some of the best technical reviewers an author could ask for (Adam, David, George, and John). The result is a lean 150 page guide that covers what I feel are the most important topics with which a PHP developer should be familiar. The book is due to be published in October (in time for the Zend PHP Conference and Expo), but you can buy it from Amazon today. As Adam jokingly suggests in his infamous email signature, "avoid the holiday rush - buy your copy today!" I plan to launch a companion web site in time for the book's publication, and I will post code samples (I created a few utilities in order to demonstrate some attacks) and aggressively keep up with any errata that is discovered. Now, I can finally start contributing to other things again. :-) I hope you enjoy the book, and I hope it helps.